There’s more to a truck than just the name. There are numerous options, features, packages and trim levels that make each and every truck unique from each other. But what do the trim level codes mean? We’ve broken down the 4 GMC Sierra trim levels to make it simple. There are 4 trim levels available for the Sierra, as well as 3 special edition packages, as well as a special special edition that can be added to one of the special editions. 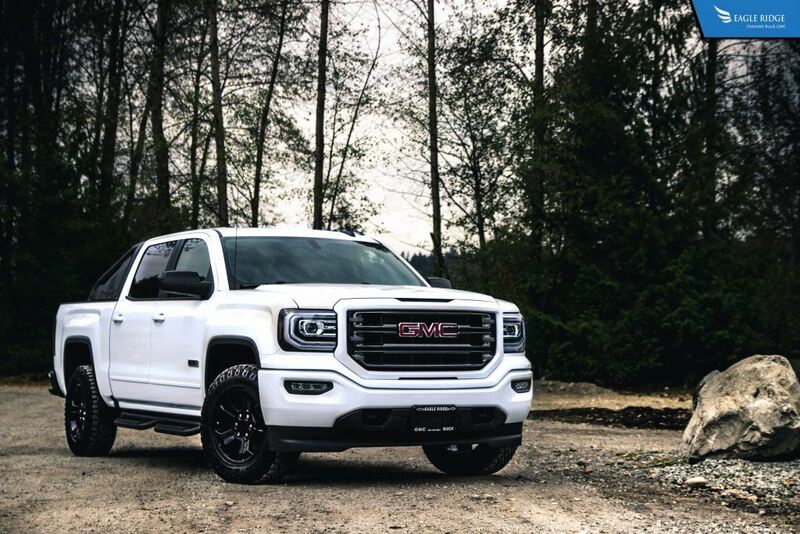 The trim levels are Sierra Base, Sierra SLE, Sierra SLT and Sierra Denali; the special edition packages are Elevation, Kodiak and All-Terrain editions, as well as an All-Terrain X package that can be added on to the All-Terrain edition. Each trim level signifies a difference in standard exterior styling, interior design, and mechanical performance. Of course, drivers are able to add on options from higher trim levels to a lower trim, to a extent. For example, customers cannot get the Denali exclusive magnetic ride control in the lower trim levels, and Denali customers cannot get the 4.3L V6 engine. The trim levels start off with the base model, referred to as just “Sierra”. 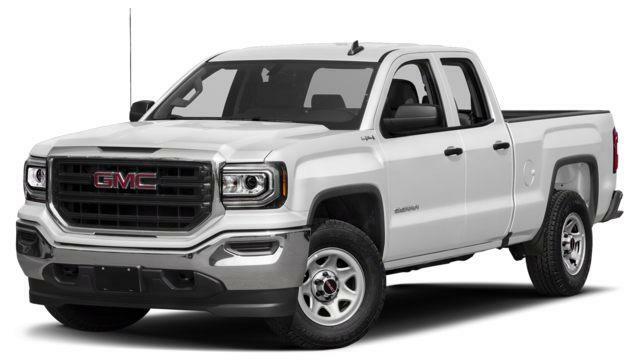 The Sierra trim comes standard with a 4.3L EcoTec3 V6 engine. EcoTec refers to the technologies GMC has implemented into their engine, which includes Direct Injection, Active Fuel Management and Variable Valve Timing, all of which increase both power and efficiency. The base model is only available with a 6-speed transmission, and is only rated for up to 6700 lbs GVWR. 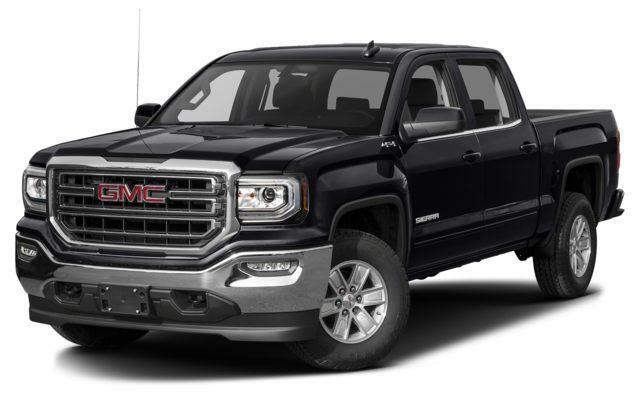 Cosmetically, the Sierra trim has black door handles, black grille, black manual adjust mirrors and no side body moulding. 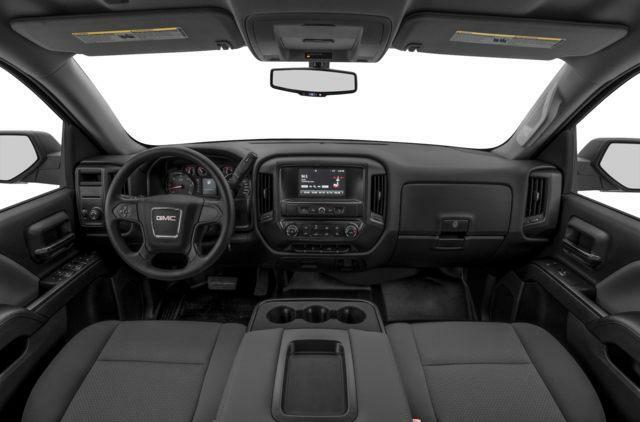 On the inside, this trim also comes with a floor-mounted shifter for the transfer case, which controls whether the truck is in 2WD or 4WD, a smaller 7″ infotainment system, a rubberized vinyl floor covering, and the absence of under-seat storage in the middle front seat. As a result, many GM customers looking for work trucks to add to their fleet tend to go with the simpler Sierra trim. The next level up is the SLE trim. Although the SLE trim is only one step up from the base Sierra trim, it is a big step up in features. The standard drivetrain in the regular cab is identical to the base trim, with the 4.3L V6, but the GVWR does increase to 6900lbs. In the crew cab, the engine is upgraded to a 5.3L V8, with a GVWR of 7200lbs. An automatic locking rear differential is included and the transfer case is electronic, located to the left of the steering wheel in a dial form, clearing up space on the floor. Externally the door handles and mirror caps are body-coloured, and this trim comes with body-coloured side mouldings. Some outside convenience features include a tinted rear window, EZ-lift tailgate which ensures that the tailgate never slams when let go, remote locking tailgate, heated power-adjuatable mirrors and cargo box lighting. On the inside, the driver information center gets upgraded to a 4.2″ multi-coloured version, which can be controlled with the steering wheel. The infotainment center also increases in size to 8″. Floor carpeting, wifi-hotspot, HD radio, and illuminated vanity mirrors are also standard. The front 40/20/40 split bench also comes with convenient under seat storage. The steering wheel gets upgraded to a leather wrapped version, with cruise and audio controls, and the SLE trim comes standard with remote keyless entry. This high-end trim builds on the SLE trim, with some major changes available as options. The engine is upgraded to a 5.3L V8, with an available 6.2L V8. An 8-speed automatic transmission is available as an option, and the GVWR increases once again to 7200lbs. An external transmission oil cooler, which was optional on the lower trims, becomes standard on the SLT. Trailering equipment, which includes a 2″ hitch and 7-pin connector also become standard. The side mouldings, door handles and mirror caps are standard in chrome, but is also available in body colours, if chrome isn’t your thing. Fog lamps and LED taillights aid in visibility. Stepping inside the Sierra SLT, both driver and passenger get with heated seats and individual climate control. Leather adorns the seats and the rear bench seat is split 60/40. Power-adjustable pedals, rear window defogger, and remote start also help with convenience. The SLT trim is not available in a regular cab; instead, it is only available in a Double or Crew cab. Last but definitely not the least, the premium trim level is the Denali. 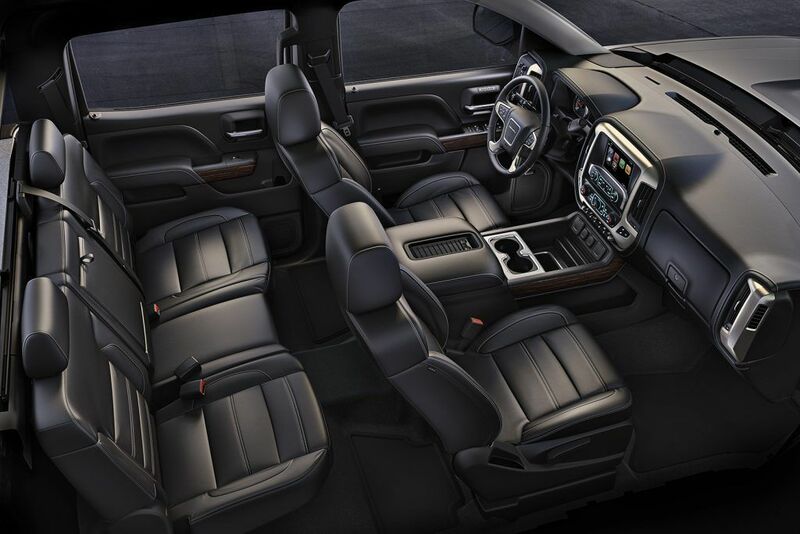 The Denali line combines function with luxury, offering top-of-the-line standard features. First, the drivetrain gets upgraded to an 8-speed transmission. 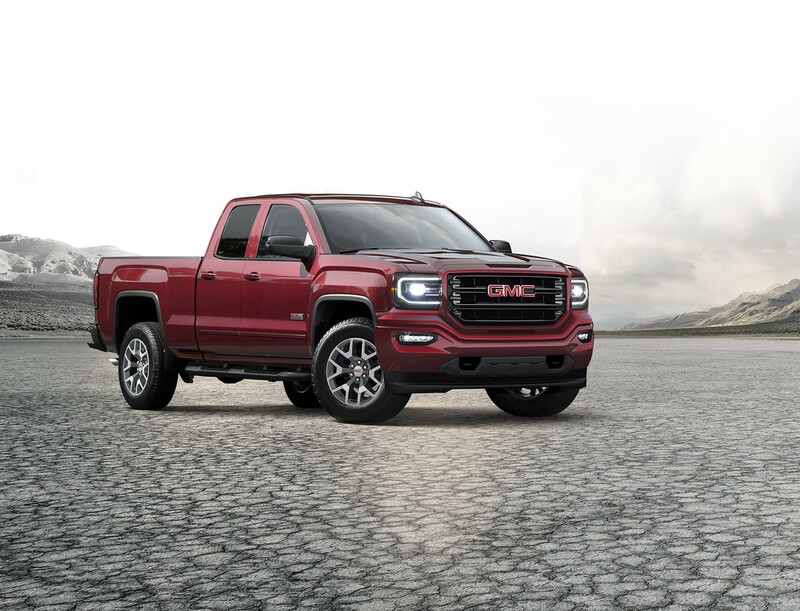 The 2018 GMC Sierra Denali also comes standard with a high-capacity air cleaner, automatic low-speed braking as part of its safety package, and magnetic ride control. The magnetic ride control reads the road and changes the damping in the suspension with electromagnets instead of moving valves to increase traction and steering precision. On the underside, the transfer case comes with a shield, protecting it from anything on the road that may cause damage. Moving on to the exterior, the first things you will notice on the Denali trim is the Denali exclusive chrome grille, and the standard chrome side-steps. These steps can be upgraded to an automated version, which slide out when a door is opened, and slide back under the truck when the doors close. 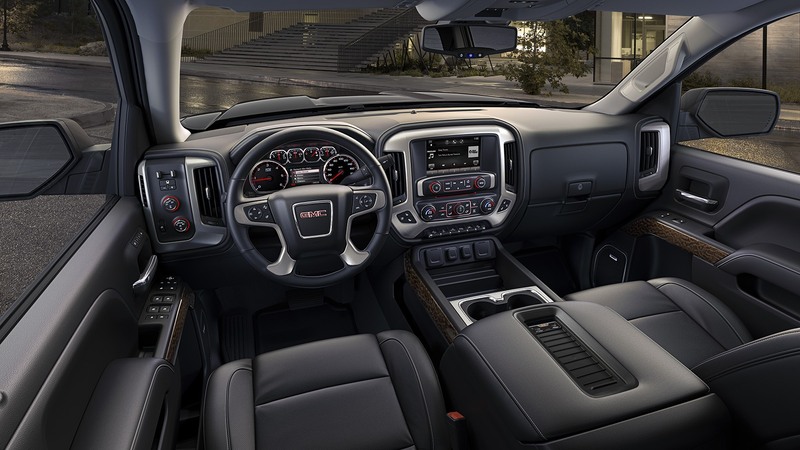 The interior of the Denali trim is meant to exude luxury. Leather and soft touch materials cover the majority of the cabin. 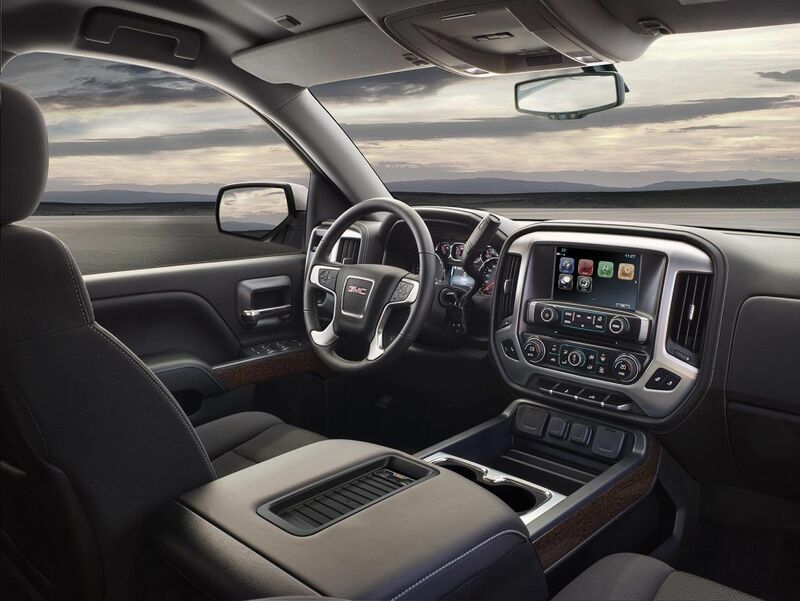 In addition to the SLT trim features, the Denali trim adds ventilated front seats, Safety Alert Driver’s seat, wireless phone charging, heated steering wheel, and Denali logo on the seat headrest and steering wheel. 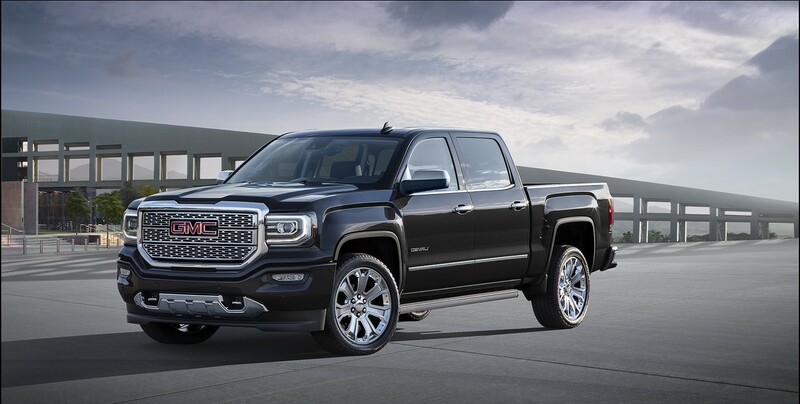 The 2018 GMC Sierra can be equipped with special edition packages that add a few unique features to each truck to make them stand out a bit more.